Spring is almost here, and with it will come the bees and wasps. These little striped bugs can be extremely beneficial for our ecosystem, but can also be a bit of a pain to deal with. Stings are painful and if you’re allergic, they can be deadly. While awnings provide luxurious shade during the hot summer months, they can also serve as the perfect place for these hostile house guests to set up shop. If you end up with a nest of bees or wasps tucked into a corner of your awning, you’ll need to call a professional to have them safely and humanely moved. Save yourself the trouble and take a few precautions to make your awning a less appealing target for bees and wasps. Eliminating the possibility that bees or wasps will nest in your awning isn’t just about protecting the awning itself. If you get rid of factors that will draw them too your yard altogether, you’ll have a better chance at stopping the problem before it starts. Some of the biggest bee and wasp attracting culprits are food, flowers, and sugar. Sunshine-filled summer days often call for lounging underneath your awning with sweet tea in hand, but be careful not to leave that tea sitting out for hours after you’ve headed inside. Sugary drinks are very appealing to bees and wasps, and will send them straight your way. In general, it is best to keep food and drink locked safely away inside your house, instead of leaving it outdoors. They’ll come for the feast and stay for the awning. 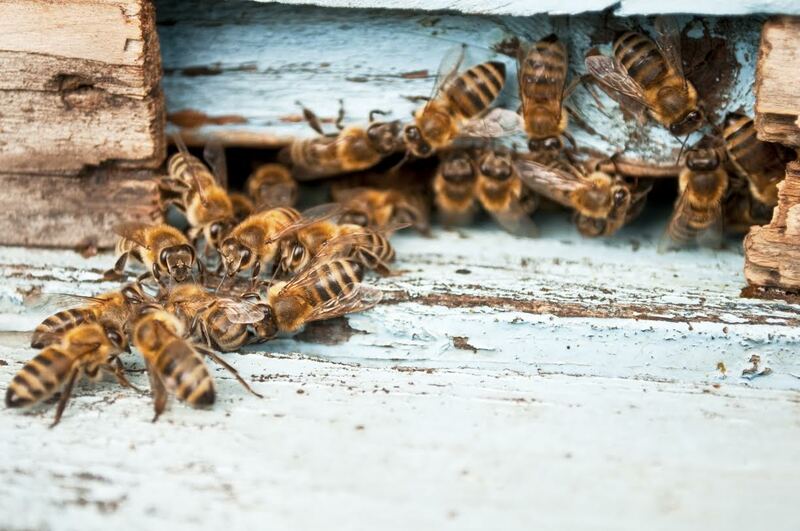 Your trash can serves as a beacon for hungry bees. An open trash has plenty of options for snacking on sugary leftovers like coffee drinks and sodas. Aside from removing your awning, the only way to make your outdoor space bee-proof is to eliminate the other factors that draw them in. Every outdoor space can be beautified by spectacular gardens and abundant flower pots, but this sort of foliage will have the bees and wasps coming from miles away. Nectar from flowers is the number one food source of bees, and if you offer it up on a platter, they will come, and your awning might just become their new home. Bees and wasps are both dangerous and important. Many people try to squash a nest with fire, bats, and other forceful methods. This isn’t your best option. The sweet striped creatures end up dead, and you could end up with several stings. It’s in everyone’s interest to call a professional to ensure that your awning can be enjoyed all summer long.